Bob Berdella was an American serial killer who raped, tortured and killed at least six men. Any discussion of the chart of someone who performed such vile acts is difficult and its important to bear in mind the themes raised in the case of Peter Sutcliffe. Berdella has a powerful opposition between the Moon / Ascendant conjunction and Saturn indicating serious emotional suppression and significant difficulties in relationships. The Sun’s conjunction with Mars and opposition to Pluto indicates a violent streak. Berdella was arrested and sentenced to life imprisonment in 1988 when Pluto was square to his Sun. No other major aspects occurred because he died of a heart attack in prison in 1992 as Pluto finished its business with the square to Mars. An important point to make is that not everyone born with this kind of chart would become a serial killer. They may well have serious emotional issues and a violent temper. Pluto’s role in Berdella’s life was both testing and karmic. 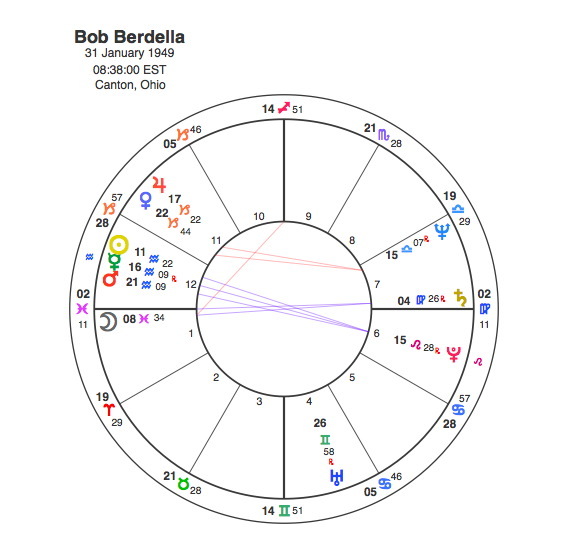 Its position in his chart gave him a violent side but he chose to express this in the most horrific way imaginable, so when Pluto made its transit to his Sun and Mars it took away his liberty and his life.